Insurance and Assistance linked to Payment Cards and Bank Accounts in Europe investigates the market for insurance and assistance policies linked to banking products across 20 countries in Europe. 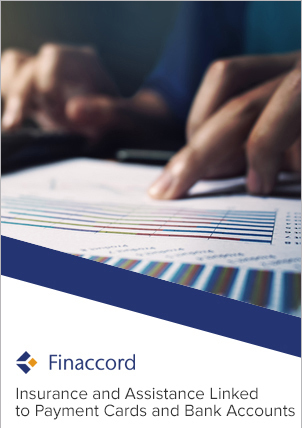 Composed of a series of cover types designed to enhance the payment card and current account operations of banks and other card providers, Finaccord’s research indicates this market to have been worth some EUR 3.34 billion in 2016.
quantification of the market size and segmentation for insurance and assistance linked to payment cards and bank accounts: how much is the market likely to be worth across the 20 countries considered, how does it break down by broad category, how much is funded by the banking institutions themselves and how much is paid for separately by customers? calculation of provider share of partnerships based on number of relationships: which providers of insurance and assistance policies have been successful in establishing relationships with banking institutions and other card issuers or distributors, and how does this vary by country? availability of an accompanying PartnerBASE database that details each of more than 14,500 insurance or assistance enhancements to the 3,650 payment cards and bank accounts analysed.